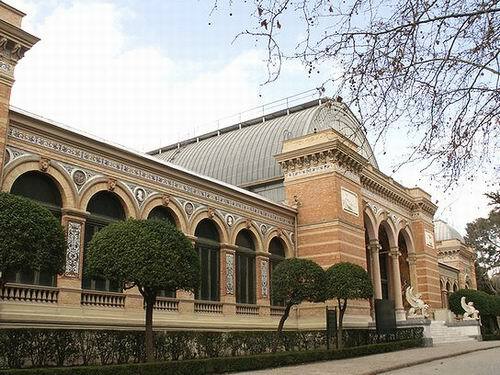 Situated in the middle of the Buen Retiro Park, the 19th century Palacio de Velázquez was originally built for a national exhibition to celebrate the mining, metallurgy, ceramics, glass-making and mineral water industries. When the exhibition was over, the government decided to maintain the pavilion, which it intended to use as a museum for overseas exhibits. Nowadays, it is owned by the Ministry of Culture, and is used for exhibitions organised by the Museo Reina Sofia. The building is named after its architect, Ricardo Velázquez Bosco, who was also responsible for the Palacio de Cristal in the same park and a number of other buildings in Madrid. His work was informed by his experience in renovating a number of important traditional buildings, such as the Cathedral of Léon and the Mezquita in Córdoba (which was originally a mosque). In designing both the Palacio for the Mining Exhibition and the Palacio de Cristal he was influenced in his choice of iron and glass by London's Crystal Palace and the Great Exhibition of 1851. His style is also characterised by the use of ceramics, and this building is no exception with its colourful ceramic patterns all around the outside. He commissioned Daniel Zuloaga to produce the tiles, which stand out alongside the two-toned brickwork of the exterior to create an impressive effect. The main structure is made of iron vaulting with a large dome and ample use of glass to provide natural light. An impressive set of marble steps lead to the main entrance from the park. You can reach the Palace by walking through the Retiro Park, where will find it next to the well-known Artichoke Fountain. In summer, the trees afford pleasant shade from the midday sun, and a welcome retreat from the bustle and traffic of the capital. From October to April, the Palace is open from 10am to 6pm, closing at 4pm on Sundays and holidays. From May to September, it is open from 11am to 8pm, closing at 6pm on Sundays and holidays. It is closed to the public on Tuesdays year round. It is only a short walk from Madrid's major museums, the Prado, Thyssen-Bornemisza and Reina Sofia, and the nearest metro stations are Banco de España and Retiro. There are plenty of small cafes and restaurants in the area around the park, which do reasonably priced lunches, and in summer the park hosts a number of events, including the Madrid Book Fair.